Service Station Equipment-Gas Station Supplies, Nozzles, Swivels, Breakaways-White Tucker Company - Graco 50 ft Hose Reel 1 1/2"
OR FOR SHIPPING RATES AND INFORMATION. 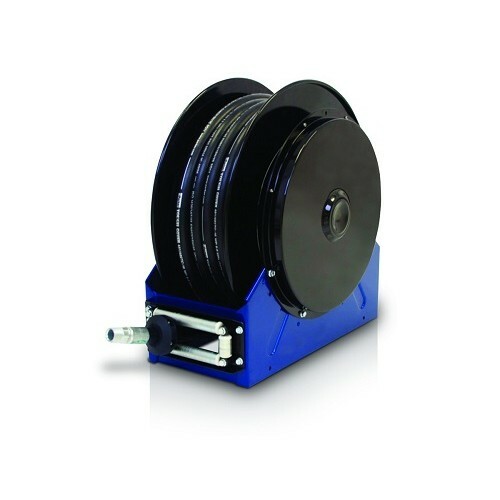 Graco Hose Reels serve as a method for storing hoses in a large number of locations. They have a rotatable base that allows them to be attached to any wall or ceiling at any angle. Their rugged construction leads to their very long service life, and their efficient design enables them to be both easy to use and effective. These reels can store hoses that are able to handle a wide variety of fluids, such as petroleum, synthetic based oils, water, air, anti-freeze, fuel, and other waste oils.